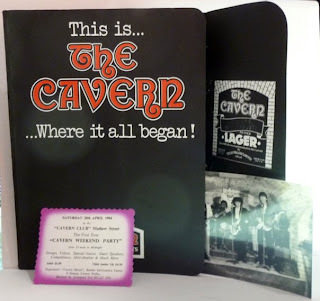 Liverpool Beatles Auction: Let's Go Down the Cavern..and the new one too! Cavern items always feature in our auctions. Here's a couple of items that cover the club old and new! 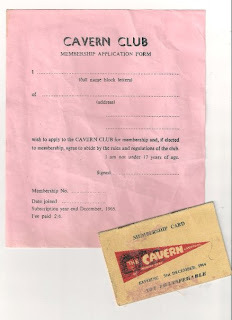 First of all there's a membership card from 1964 and an blank membership form. The card dates from after the Beatles stopped playing at the venue which means it is less valuable than those covering dates when they did play there. But the club member would have seen an amazing array of Mersey Beat bands over that year. Of course the Club eventually closed and was filled in, before finally being demolished to make way for the Cavern Walks Shopping Centre that stands in Mathew Street now. In 1983 the owners of Cavern Walks opened the replica Cavern Club that still houses a myriad of music groups to this day. This is the press kit for the relaunch.